I absolutely love autumn baking! As soon as September comes I just want to put pumpkin and cinnamon in everything I bake! I make pumpkin pie every year and when I first started this tradition you couldn’t buy tinned pumpkin puree in the UK. 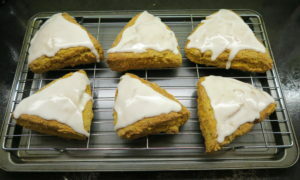 Now it’s readily available I’m making lots of other pumpkin recipes too, like these yummy Pumpkin Scones. They are filled with Autumn spices and drizzled with a sweet glaze. First I put the self raising flour, caster sugar, salt, cinnamon, nutmeg, ginger and cloves in a bowl and mixed together. Then I added the butter and rubbed together with my hands until it resembled breadcrumbs. In a separate bowl I whisked together the egg, milk, and pumpkin puree. I combined the pumpkin mixture with the flour and mixed until a dough formed. I placed it onto a floured service and roughly shaped it into a circle. Then I used a knife to cut it into triangles. This recipe makes six scones, but you can double it to make more or cut smaller triangles or circles with a cutter. I placed the shaped dough onto a lined baking tray and baked on 200C Fan/220C/425F/Gas mark 7 for about 15 minutes. They were beautifully golden brown. My kitchen smelt so good! I put the Pumpkin Scones on a cooling rack and meanwhile made the two glazes. For the base glaze I mixed the icing sugar with the milk then spread it over each scone. For the spiced glaze I mixed the icing sugar, cinnamon, nutmeg, ginger, cloves and milk together. I put the spiced glaze in a piping bad a made a zig zag pattern over each scone. 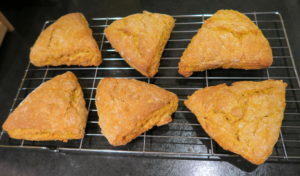 These Pumpkin Scones are yummy and full of the taste of autumn and the festive season. They are so light and fluffy inside too! 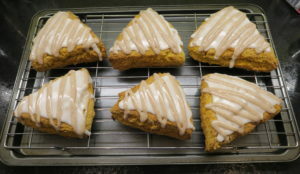 The glaze and drizzle are so scrumptious and make the Pumpkin Scones into a lovely sweet treat perfect with a hot drink. 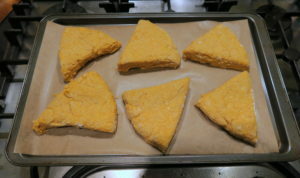 You don’t have to add the glaze, you could cut the Pumpkin Scones in half and spread with butter instead, but it does make the scones look very pretty. 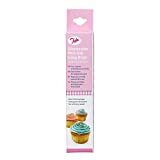 You could also try adding dried fruit to the dough. I think cranberries or sultanas would go well. Make yourself a tea or coffee and enjoy a delicious scone! Man alive Kat, they look good. So good, I can almost smell them!